Expanded is vastly populated with different decks, creating unique gains and losses as a result of the Expanded format bans a quarter ago. Of the affected decks, Zoroark-GX certainly lost the most. It has the tools to recover, though, but some things will be lost in the void, Ghetsis and Puzzle of Time, for one. Hex Maniac has a pseudo replacement out there, Garbodor with Garbotoxin, the focus of this piece. Garbodor can be deactivated on your turn with three different cards right now: Bursting Balloon, Field Blower, and Klefki. My list plays all three of these because it is nice to have different options for different situations. The main goal here is to recreate a way to get all of your Exeggcute back from your discard pile, use your Trade Abilities, and then have a way to shut off an opposing Sudowoodo so you can fill your Bench to the brim and take one-hit Knock Outs. Ability lock is especially crippling for decks based around Abilities themselves, of which Expanded has many varieties. Melding lock and power together is always a strong combination, and while this deck is new on the surface, it’s really just a revision of the older Hex Maniac archetype, just shifting cards around to make do with the cards available in the current pool. Rudimentarily, Zoroark-GX is strong, but Sudowoodo nerfs it. You need Garbotoxin to get your Sky Field kicking at full power, and the Ability lock accompanying it is incredible as well. Zoroark-GX is the most consistent Expanded format deck once it gets running allowing you to plow through your deck and kick out big attacks. It’s still positioned well because it can stack up to anything, with Ability-based decks reentering the format you take favorable matchups to those, and you retain decent matchups against things like Garbodor / Drampa-GX and Trevenant BREAK. It’s never a bad idea to stick with a tried and true concept, so if that’s where you’re at, this is the deck for you. Please play the Zorua with Paralyzing Gaze, it is simply the best. Any nonsensical split you stoop to is simply incorrect, this one just gives you outs to certain situations and make crank out a turn where you get to chill if you flip heads. Zoroark also has been falling out of favor in many Zoroark-GX decks, but that’s just wrong. Mind Jack is a powerful way to deal meaningful damage, and sometimes even one-hit Knock Outs, especially in mirror matches. It’s a great one-Prize attack that helps you stay in the Prize race if you’re to fall behind against a deck like Night March. It’s also an out to Special Conditions and a way to switch your Pokemon around in a pinch with a Float Stone attached. 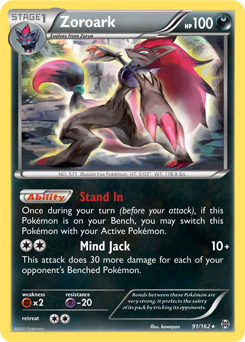 The Zoroark with Foul Play is alright, a better way to counter Buzzwole-GX decks, but I’m still a bigger fan of this one. Set Up is a broken Ability; it helps you set up… Brigette is a little too slow for Expanded nowadays if you ask me, so I prefer a Shaymin-EX-based setup with more Item-based Pokemon search cards. As such, a single Tapu Lele-GX is really all you need now, sometimes granting you passage to Brigette or sometimes getting you the tech Supporter of your choice at a critical moment. While this deck can and will bypass Roadblock, you aren’t quite as explosive as you once were. That being said it’s more reasonable to play less Exeggcute, something that I think was fine in the past as well, quite frankly. With 12 Basic Pokemon outside of Exeggcute itself, you’ll be more than fine finding that last Pokemon for a full Sky Field Bench. Exeggutor is a crutch for me, I haven’t been using it often in testing, but it’s something I’m just attached to after playing it for so many events last season. It gives you a strong matchup against Wailord-EX decks by stopping their disruptive Supporters and giving you time to soften up Wailord-EX with Blockade and can turn the tide in games you “weren’t supposed to win”. It’s a comeback/surprise card, and one of the most cuttable cards in the list if you want to take a more consistent, basic approach. I list it only because that’s what I’m playing right now and I don’t want to hide anything; it’s certainly not for everyone.